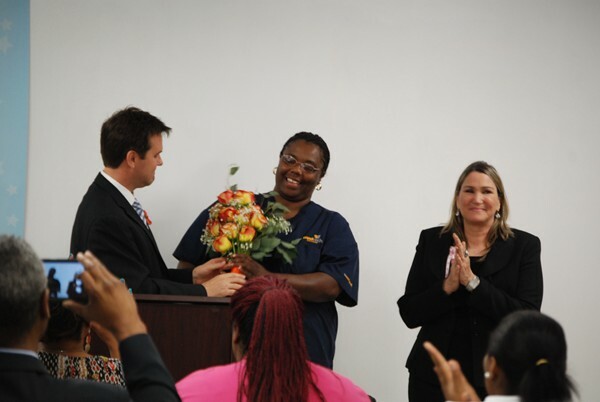 LaTasha Clark, a student at Medtech College, is presented with a dozen roses for Mothers’ Day. Photo by Lauren Ramsdell. All mothers are extraordinary. But one local mom has made motherhood her mission. LaTasha Clark is the mother of 15 children–four biological, seven adopted and four fostered. While she is new to the area, having recently moved here from Alabama, she was recognized May 22 with the Extraordinary Mom Award at the Medtech College Atlanta-DeKalb campus, where she attends school. A committee including Simms and the heads of departments formed to honor all mothers and to determine who would be getting the Extraordinary Mom Award. Over two weeks, students nominated peers and according to Simms, an overwhelming number of students selected Clark. Her seven adopted children came from the Alabama foster care system, where they were sent after drug abuse and alcohol problems came to light in their biological families. Living with Clark in her home are her youngest son, and his girlfriend. The three attend Medtech College together, while Clark also works full-time as a home health aide. The award was presented in the middle of class to a surprised Clark, who held back tears until after the short ceremony. A retired registered nurse, Clark is now in the billing and coding track at Medtech. She said her children needed that extra push to go back to school, so she did it with them. Her first calling for her large family came when she recognized a friend of her children’s at the courthouse where she formerly worked. The routine was to come home from school, do homework, then play. If you did your work, there were rewards, like the annual family trip to Disney World, she said. One of the friends who hung around the house was in and out of foster care, though Clark didn’t know his situation. While working as a fill-in for the local judge’s secretary, Clark saw the child come in to court. Clark said neighbors claimed the child was going to be the one who didn’t make it. But he thrived with his new family, serving with the army for four years and earning an E-4 rank. He is now married with two children and returned from Afghanistan in January. Clark has also seen her share of struggles. One son died in a car accident, and this past Thanksgiving, her oldest son was found murdered. But she said she was at peace with the loss, and that his time had come. In 2013, Clark was resuscitated by paramedics when her heart stopped due to diabetic complications. She didn’t find out who saved her life until she went to pay the medical bill. “I thank God for him, because I know God has a purpose that I’m still here,” Clark said.